The Test of English for International Communication (TOEIC) is an English language test designed specifically to measure the everyday English skills of people working in an international environment. The Educational Testing Service (ETS) developed the TOEIC test to measure achievement in using English in a business setting in Japan. Thai educational institutions use TOEIC-based tests for placement in classes. The Listening & Reading (990 marks in 2 hours) Multiple-choice test consisting of 200 questions evenly divided into listening comprehension and reading comprehension, scores given for written and listening comprehension on a scale from 5 to 495 points. Reading (495 marks) 60 mins 36–56 questions Read 3 or 4 passages from academic texts and answer questions. The CU-TEP (Test for English Proficiency) is for undergraduate university students interested in studying at Chulalongkorn University's graduate programs in English and International Studies. CU-TEP measures the ability to use English for academic purposes in reading, writing, listening, and speaking for undergraduate and graduate admissions. Required level is Upper Intermediate English. (120 marks in 2 hours). Students need to get at least 60 in order to pass the test. Students wishing to study in Chula’s International programme must first pass their CU-TEP before attempting the CU-AAT or SAT. CU-TEP is similar to TOEFL, but there is no Speaking test and it is considered slightly easier than TOEFL and CU-AAT. The Thammasat University Graduate English Test (TU-GET) is based on TOEFL. 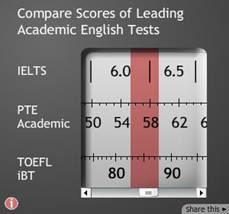 The pass mark equivalent is TOEFL iBT (80), IELTS (6.0). The Test of English as a Foreign Language (TOEFL) evaluates the ability of an individual to use and understand English in an academic setting (TOEFL iBT: 120 marks in 4 hours). TOEFL was developed by Stanford university to ensure English language proficiency for non-native speakers wishing to study at American universities. A TOEFL exam is taken on computer and the score is valid for two years. The College Board and ETS jointly administer the exam with the guidance of the TOEFL board. The test can be taken within 1to 4 weeks of applying. Note-taking is allowed during the iBT. The test cannot be taken more than once a week. 3–4 passages (700 words in length), each containing 12-14 questions. The passages are on academic topics (material that might be found in undergraduate university textbooks). Passages require understanding of rhetorical functions such as cause-effect, compare-contrast and argumentation. Students answer questions about main ideas, details, inferences, essential information, sentence insertion, vocabulary, rhetorical purpose and overall ideas. New types of questions in the iBT require filling out tables or completing summaries. Prior knowledge of the subject under discussion is not necessary to come to the correct answer. 6-9 passages 3–5 minutes in length, each containing 5-6 questions, which include two student conversations and four academic lectures or discussions. A conversation involves two speakers, a student and either a professor or a campus service provider. A lecture is a self-contained portion of an academic lecture, which may involve student participation and does not assume specialized background knowledge in the subject area. Each conversation and lecture stimulus is heard only once. Each conversation is associated with five questions and each lecture with six.The questions are meant to measure the ability to understand main ideas, important details, implications, relationships between ideas, organization of information, speaker purpose and speaker attitude. Test-takers may take notes while they listen and they may refer to their notes when they answer the questions. 2 integrated tasks to read a short passage, listen to an academic course lecture or a conversation about campus life and answer a question by combining appropriate information from the text and the talk. 2 integrated tasks to listen to an academic course lecture or a conversation about campus life and then respond to a question about what they heard. Evaluation based on ability to appropriately synthesize and effectively convey information from the reading and listening material. Test-takers may take notes as they read and listen and may use their notes to help prepare their responses. Test-takers are given a short preparation time before they have to begin speaking. The responses are digitally recorded, sent to ETS’s Online Scoring Network (OSN) and evaluated by three to six raters. integrated task: read a passage on an academic topic and then listen to a speaker discuss the same topic. The test-taker will then write a summary about the important points in the listening passage and explain how these relate to the key points of the reading passage. independent task: write an essay that states, explains, and supports their opinion on an issue, supporting their opinions or choices, rather than simply listing personal preferences or choices. Responses are sent to the ETS OSN and evaluated by four raters. Try to take your TOEFL at the end of Semester 1, in October 2014.